DENTON, Texas, Oct. 31, 2018 /Christian Newswire/ -- According to Psalm 50, the cattle on a thousand hills belong to God, and a Texas church is rounding some of them up to feed his people. The range-riding Cattle Ministry begun at Denton Bible Church (DBC, www.dentonbible.org) is believed to be the only one of its kind in the country, providing free, high-quality ground beef to those in need. 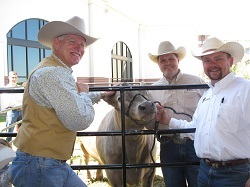 Photo: Denton Bible Church senior pastor Tom Nelson (left) inspects one of the church's Cattle Ministry steers with church members Daryl Real (center), who is Senior Vice President, Agriculture and Livestock, for the State Fair of Texas, and Everette Newland. Around 20,000 lb. of grass-fed meat, accounting for more than 90,000 servings, are due to be given away this year through the church's Food Club, which provides meat, vegetables and other staples to local organizations, and through its own Vision food pantry. This year's total Cattle Ministry meat offering has a retail value of around $100,000. The Cattle Ministry is just one way DBC helps feed the hungry. It also runs the 14.5-acre Shiloh Fields, which is believed to be the largest church-run community garden in America, providing fruits and vegetables for local community service groups. Both food programs are part of DBC's wide range of caring ministries that aim to demonstrate God's love in practical ways. "There are so many people in our community that are in need," said Kim Clarke, a DBC member and one of the long-time volunteers. "To be able to provide some assistance to them in this way is so rewarding." Packaged with the ministry's horns logo and stamped with a Bible verse, the free meat has proved a hit in the local community. One mother who turned to the Food Club for help after falling on hard times emailed her thanks and said that "the beef and pork were amazing; my sons loved it so much." Employed by an electrical contractor, Clarke said that volunteering up to ten hours a week with the Cattle Ministry enabled him to fulfill a lifelong interest in ranching. "As Christians we are called to serve, and to find a way to do so that you really like is a blessing."